Keeping trucks on the road is the goal of every fleet. While today’s vehicles are durable and reliable, they still need to be maintained and they do breakdown on occasion. The efficiency of the maintenance and repair process can mean the difference between delivering a load on time and disappointing a customer. Because of the importance of parts and service to fleet efficiency, fleet owners and managers pay close attention to developments and trends in the truck parts and service aftermarket. OEM and OES channels vie for fleet service business. 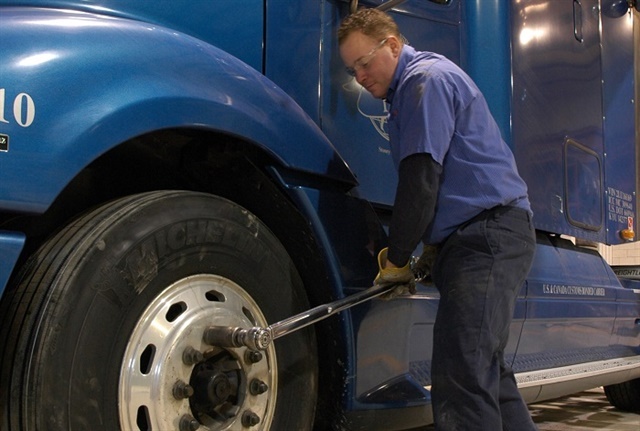 With the increased focus on uptime, the decision about where to get vehicles serviced has taken on greater importance. Fleets need to decide whether to do it themselves, outsource it to a dealer, outsource it to an independent repair garage or use some combination of options. 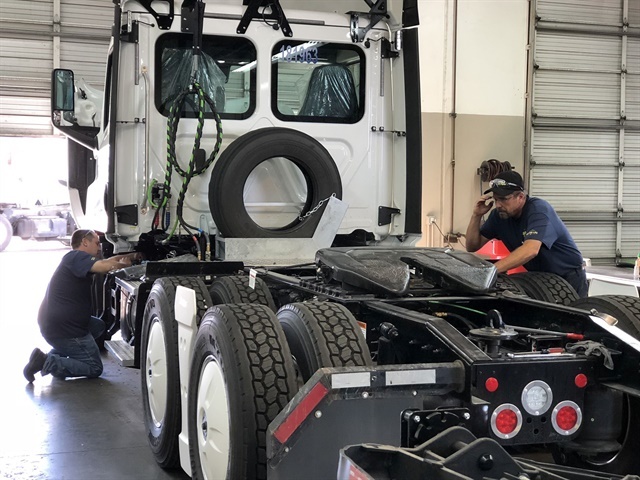 Dealers have been hard at work trying to win fleet service business by streamlining the repair process, performing service at the fleet’s location, and teaching fleets to recognize potential problems with a truck early on and then to bring the truck in quickly before a minor issue becomes a major one. The independent channel is also working to improve its service capabilities. And while fleets continue to say they want to outsource more of their service work, according to MacKay & Co., the reality is they are still doing a lot of the work in-house because they have not found the right service provider. When evaluating service providers, fleets need to start with a list of expectations of not only the types of work they need to have completed, but the hours in which they want the work completed. Savvy fleets are asking potential service providers if they are willing to customize their maintenance and repair policies so they match those of the fleet. That way whether the work is done in the fleet’s shop or by a third party, it will be completed in the same manner to ensure consistency across the fleet. When fleets do choose an outside service provider for some or all of their service, they need to make sure they are not the ones slowing down the process by not approving repairs quickly and failing to respond when the service provider needs additional information or authorization to proceed with a repair. Supply chain health matters to a fleet’s success and it needs to include supplier to distributor and distributor to fleet. Fleets and distributors need to work together to take inefficiencies out of the supply chain. To do that, fleets need to make sure distributors fully understand their business and fleets can't just turn to distributors for slow-moving parts and free technical expertise. While buying parts oonlinecan save fleets money, they still are going to need local support so they need to have a healthy parts distribution network available. There are some interesting things happening with truck parts. Vehicle Maintenance Reporting Standards codes have been used in the trucking industry for quite some time, but not everyone is using them. VMRS is a living system that changes as needed to reflect market changes. VMRS is much more than the 9-digit product code and helps systematize the maintenance and repair process. In addition to VMRS, the Auto Care Association is spearheading an effort that would allow for the more efficient movement of parts through the supply chain. PIES (Product Information Exchange Service) are being developed starting with the top 20 category of parts used on heavy-duty trucks. The standards are voluntary and the part manufacturer provides information about the part, including things like product dimension, dimensions of packaging, materials used in manufacturing, etc. Having this information in a standardized format will make it easier for fleets to compare parts more accurately prior to purchase. Ultimately, the goal is to make sure fleets are getting the right part at the right place at the right time and at the right price. For years, there has been a debate about the difference between OEM and aftermarket replacement parts, with some people thinking aftermarket parts manufacturers don’t have the resources to provide the same quality, availability, and warranty as their OEM counterparts. At least one aftermarket parts manufacturer thinks that is changing. Manufacturers of branded aftermarket parts are now using validation processes for all parts that they say are similar to what the OEMs are doing. Fleets will have to decide for themselves if aftermarket replacement parts are right for them. When making the purchasing decision, make sure to ask questions about process, quality control, warranty, and after-sale support. In a somewhat futuristic manner, truck parts suppliers may take a lesson from their industrial distribution counterparts and consider selling parts from vending machines. Bill Wade, managing partner of Wade & Partners believes it is not far-fetched that someday truck parts will be available from vending machines. Companies such as Fastenal and 1sourcevend are already using vending machines in industrial plants for things like tools, safety glasses, and even small parts. Will we see things like belts, hoses, seals, and bearings at vending machines at truck stops? Time will tell. The technician shortage continues, but there are some things fleets can do to get techs in the bay. While there is no silver bullet to solving the technician shortage, making changes to your recruiting efforts can help you get the techs you need. Try active recruiting with a dedicated recruiting team that is actively searching across the country for eligible candidates and keeping an up-to-date contact list of eligible technicians so when a need arises, you have a candidate pool available. Shift your recruiting efforts so that rather than concentrating on your needs, you look at what technicians is looking for in a job based on their current experience and expertise. Some fleets are using outside recruiting firms that have dedicated staff looking for potential candidates and who keep their pulse on their market area, especially as it pertains to pay rates and benefits. Nowhere is the need for technicians greater than at the entry level. For example, Pro-Mech Learning Systems introduced a TechSpedite program that it says can teach students how to do basic shop tasks, such as performing PM inspections and diagnosing and repairing common service problems. The four-week program is a combination of classroom instruction and hands-on practice. And while the program only gives these technicians limited skills, they are practical ones that can be put to use in the shop immediately. Can cores become less of a sore spot in the remanufacturing process? Cores have long been the biggest pain point for everyone involved in remanufacturing. Unfortunately, there is no consensus on what makes them so difficult. Sometimes the problem is with traceability and tracking of cores. Other times it is identifying cores or determining core condition. Haldex is working on the problem by exploring a more flexible core program that tries to alleviate some of the issues customers have with cores. Tim Shaw, national sales and product manager for remanufacturing at Haldex, says better tools will help both fleets and distributors do a better job of identifying cores and determining their value. He also says the company is looking at a core buyback program. Under such a program, rather than trying to get the core charge upfront, manufacturers would buy back cores when they need them. At the time of buyback, core condition would be assessed and payment for the core would be based on the shape it is in. Two years later, “Right to Repair” is making things better for the independent aftermarket, but it’s not perfect. Two years after the Memorandum of Understanding between the Commercial Vehicle Solutions Network and the Truck and Engine Manufacturers Association and several other groups was signed, independent repair garages are still working with OEMs to get changes and updates they need. However, the National Automotive Service Task Force has indexed all OEM and supplier website links so that all information is accessible from one place — the NASTF website. NASTF has also instituted a Service Information Request feature that acts as a bridge to manufacturers when information or software is not accessible. Fleets and independent repair garages are finding workarounds and have developed relationships with dealers (especially for engine work) to see that customer’s needs are met. Despite some issues, Marc Karon, president of the Right to Repair Coalition and president of Total Truck Parts, says the working relationship between the OEMs, EMA, and independent repair garages is better off today than it was prior to the MOU being signed.